Experience the Old West on a full-day tour to Grand Canyon Western Ranch from Las Vegas. Pass Hoover Dam and Lake Mead as you drive to the ranch. 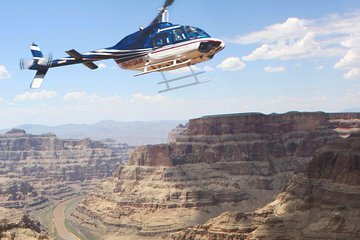 Ride in an old-fashioned wagon to the helicopter and take a 20-minute helicopter tour of the Grand Canyon. Return for a Western-style barbecue accompanied by cowboys sharing tales of ranch life and local Native American history. Enhance your western experience with a 45-minute ride on horseback that follows parts of the historical Mormon Trail through Joshua Tree National Park. Helicopter flights are available hourly from 8am to 6pm. If you need hotel pickup, pickup is available from 8am to 10am. Please advise of your preferred flight time in the Special Requirements field at the time of booking. Very well organised trip! And worth every penny! Communication on the lead up to the day trip was very good and was picked up on time from my hotel by a very informative and funny guy called Randall. The ranch experience was amazing incl.western riding and a fantastic helicopter flight into Canyon! Absolutely loved the whole day, the ranch staff looked after us so well and the Grand Canyon Helicopter trip was truly amazing and magical, would highly recommend.